"We did things others could only dream of." In the early 1990’s I had visions that my company, Baker & Associates, Inc., could become a major participant in mergers and acquisitions of consolidating industries. To do so we needed something that would separate us from the rest of the field. So we decided on airplanes and it worked. Planes not only broadened our opportunity they became a significant part of our operation. We bought our first plane, a Twin Piston engine pressurized cabin Beech- Duke in April 1995, which seated the pilot and 5 passengers. The Duke made trips to most all parts of the U.S taking me and other members of my staff on many trips to introduce buyers to clients of Baker & Associates. At this time we were dominating the seller market with hundreds of new engagements in the Respiratory/DME area of the healthcare industry. In October 1995, as our associates secured more and more clients, the need arose to acquire yet another plane, which was bigger, faster and safer. The plane, a Beechcraft King Air B-200, had turbin engines (turbo props) that flew around 300 miles per hour at a 30,000-ft. altitude. It held 7 passengers, as well as a pilot and co-pilot. By December 1995 the plane had been completely refurbished with new avionics, interior and paint. Now with two planes in operation our staff and associates were moving all over the U.S. We brought buyers and sellers together for meetings in the seller’s city. Generally, we met at an airport meeting room or the client’s place of business for 2-3 hours, and then we were off again to another place. Sometimes we would have a meeting in one city at 8 am, then four hours later be 500 miles away having another meeting for 2-3 hours starting around noon. Then we would typically have to attend a 4 pm meeting and be off somewhere else for a 7 pm dinner meeting. Having a total of four meetings and traveling around 1000 miles in one day was not uncommon. Our associates were continuing to sign up even more clients. By the fall of 1996, we found it necessary to acquire yet another plane, a Cessna Jet- Citation II, which could fly at a 40,000-ft. altitude at close to 400 miles per hour. This plane was also completely refurbished with new paint, interior and avionics. By having a jet we now had the ability to travel up to 2000 miles daily and have 3-4 buyer and seller meetings any place in the U.S. During 1996, we successfully handled over $160 million in deals. My son, Brian Baker, became an associate in 1995 and opened a 12-person office that was adjacent to the main runway for Scottsdale airport, in Scottsdale, Arizona. In 1996, their office alone was responsible for over $70 million in transactions. Some of our planes were located in Scottsdale in order to be used for trips west of the Rocky Mountains. As we entered into 1997 there were now three planes going in all directions, flying buyers to meet clients all over the country. Our staff had secured close to 1000 client engagements and we were closing more than one transaction a week during 1995-1997. We were proving that planes could be a vital part of building a successful consultant business. Baker & Associates, soon became the predominant consultant in the Respiratory/ Durable Medical Equipment industry since our deals closings continued to accelerate. In building a business there are always those companies or individuals that without their trust, support, and willingness to work with you, your opportunities may be limited. Our success in the Respiratory/DME industry was a direct result of people like Ray Noeker, who before starting his own company (Byram) was with Homedco, John Burns and Howard Deutsch of Lincare Holdings, Inc., and Steve Griggs and Bill Kennedy, the prime movers of Rotech Medical Corp., American HomePatient, Inc., Abbey Healthcare, Inc, as well as many others. These are the people who took the time to consider our clients and to make offers to acquire them. I remember specifically many times when Bill Kennedy, Steve Griggs and Larry Kuhnert of Rotech would spend three to four days a week with us flying all over the country to go see and visit our clients. We have flown to the coldest parts of the U.S. in the winter, the hottest places in summer, and in rain and snowstorms to visit hundreds of companies. It makes for some good stories and some good friendships along the way. The first deal we did in the industry was in the 1st quarter of 1994 when our client Meridian Medical of Englewood, Colorado agreed to a $20 million-plus transaction with Lincare Holdings, Inc. As time went on, Baker & Associates did deals with American Homepatient, Abbey/Homedco, which is now Apria Healthcare Group, Inc., Rotech Medical Corporation, and others who became buyers in the consolidation of the rapidly growing Respiratory/ DME industry. The Meridian-Lincare transaction was the beginning of the rapid acceptance of our services that led to the decision to purchase our first plane in 1994. Had Lincare not have completed the Meridian purchase, it is possible my company would not have had the success that came to us over the following years. 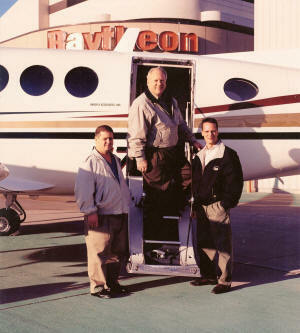 In April of 1999 we ordered a new $5,500,000 Beechcraft King Air B-350. It was a ten-passenger plane plus pilot and co-pilot. This plane was delivered in December 1999. It was used for trips all across the nation and flew at an altitude of over 30,000-ft. at 325 miles per hour. 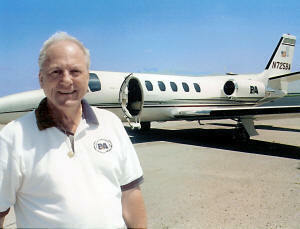 Finally in December 2001 we acquired our fifth plane, which was essential for shorter trips. This was a Cessna 421C Golden Eagle and was also completely refurbished with new interior, paint and avionics. Rapid changes such as The Medicare reimbursement cuts during 1998, the recession and stock market crash of 1999-2001, and the events of September 11, 2001 created challenging times for the nation and our company. They also unquestionably changed the number of companies acquired in the Respiratory/ DME industry and other markets Baker & Associates was working in. At the same time American Homepatient, Inc. and Rotech Medical Corporation were involved in lengthy bankruptcy proceedings. Abbey and Homedco were going through trying times with their merger, which eventually became known as Apria Healthcare Group. At the same time Home Care Supply, of Texas and American Homecare Supply, of Pennsylvania, were new acquirers in the consolidation of Respiratory/ DME independent companies. Steve Griggs, the former President/C.E.O of Rotech who formed Aero-Care Holdings, Inc., respiratory/durable medical provider and began making select acquisitions. However, together, all these companies were doing fewer deals in 2002-2003 then we were handling during the mid 1990’s. We sold the planes because of the significant retrenchment of acquisitions in the industries that we participated in. Planes were a very big part of our organization’s success during the period prior to September 11, 2001. Today we believe there is a resurgence in acquisitions of consolidating industries. We also believe there will soon be another boom period much like the period from 1982 to 1998. As this happens, new, faster and less costly planes are now being built. These new jets will hold five passengers plus pilot and co-pilot and travel at 500 miles per hour at a 40,000-ft. altitude and can be bought new for less than $2 Million. Soon Jerry Baker & Associates will be flying around the U.S again as the U.S. economy, corporate earning, the stock markets and mergers and acquisitions accelerate. "we did have a great ride!"